This raised garden starter kit is a fantastic addition to any yard. It makes gardening easy and encourages proper soil drainage so that your plants are healthier and your fruit and vegetables grow better! Why you'll love it: This garden bed brings the simple joys of gardening in a convenient to assemble kit. It also gets you outside and enjoying nature. When you grow your own vegetables, you save money and they taste better! Specially designed: It's the perfect height for proper soil drainage, without being obtrusive. We tested multiple heights during the design phase to make sure we got this right. The raised bed keeps fruits and vegetables off the ground from pets and provides a growing area large enough for multiple different types of produce. We've provided you with 9" of above ground soil depth and an elegant design that looks great in any environment. Easy assembly, hardware included. Please note that we strive for quality and consistency in everything we make, however this is made with real wood and will have natural flaws and imperfections. The split-log design features natural checking that we've accounted for when designing the strength of the product. Actual product color may vary slightly due to monitors displaying colors differently. Assembly requires installing screws which are included with the kit. Our rot-resistant unfinished Fir wood can be left unfinished with great results, or you can use your favorite paint or stain to match a theme. From the Manufacturer: We create products that get people outside and enjoying a small piece of nature. If you have any questions about this product by Boldly Growing, contact us by completing and submitting the form below. If you are looking for a specif part number, please include it with your message. 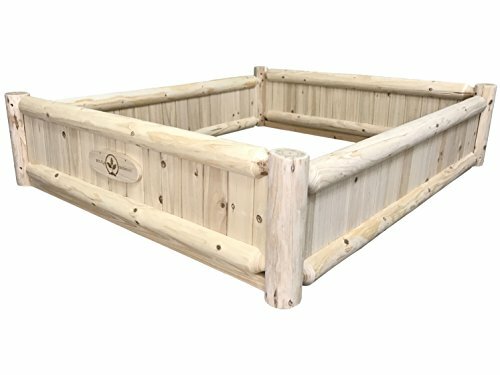 Frame It All 2-inch Series Composite Four Leaf Clover Raised Garden Bed - 10ft. x 10ft. x 5.5in.